On Sunday, a sister blogger wrote, "While I’m packing for Fantasia Fair this week some random thoughts…"
It takes me at least a week to pack for Fantasia Fair, so I took her comment to mean that she will be packing this week for Fantasia Fair, which is next week. Monday morning, I woke up and smelled the coffee. I looked at the calendar and realized that she actually meant that Fantasia Fair is this week! A couple of things threw me off. She posted on Sunday that she was packing, but on Sunday she should be in her car on her way to Provincetown (or already there) and not home packing. Anyway, Fantasia Fair is this week and I will not be attending. I will miss the sights and sounds of Provincetown and I will miss my friends who will be attending. I thought about driving to Provincetown (it's a four-hour trip), spend a day or two during the Fair to meet up with my friends and take in the events that are open to the public. But that takes a little planning and obviously, since I did not even remember that the Fair was this week, I did not plan ahead. In the past, I had a wonderful time at Fantasia Fair and I am sure I would have a good time if I attended again. A young male femulates Sailor Moon Jupiter. Welcome to "Groundhog Day" aka Retirement. NCMarko Retired since 2008 (@age55). That comment did not improve my mood. At the risk of being the pedantic nitpicker that I am: Technically, that`s not Sailor Moon but Sailor Jupiter, one of Sailor Moon`s team mates. Sailor Moon is however the name of the show so you were close. 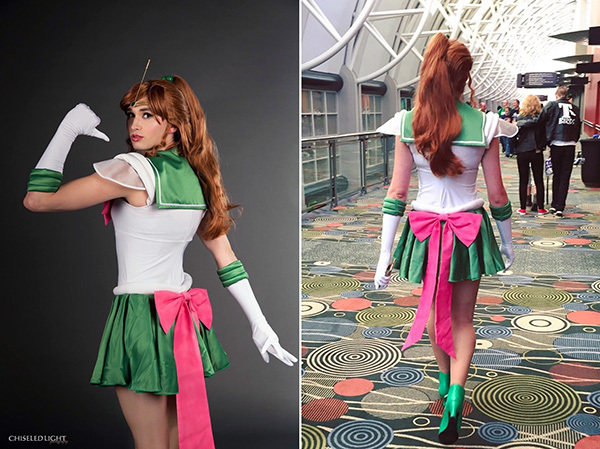 My daughter was a Sailor Moon fan way back when, so I was familiar enough to know that wasn't a Moon costume, but I was not familiar enough to know which Sailor costume it was, so thanks for the clarification. If I had the extra money right now, I'd be at Fantasia Fair. As it stands, I'll be like the Jews who said: "Next year in Jerusalem." Like you, I'm saying: "Next year in Provincetown." Yes - next year Provincetown, Marian. We can drink to it then! Finances, work, time, travel, family commitments -- all these add up to NEVER having attended one of these fairs, conferences, events or gatherings. ~~sigh~~ I envy those who can, and pray that one day I will join my sisters. Until then, be happy and think good thoughts! Hello. Over the years I've been to several trans gatherings here in the UK. They play a valuable part of a trans journey into that deliciously feminine, enticing 'Womanworld' which lies beyond and is the ONLY place to be. So for those of you so desperate to dream of Fantasia and similar events please be advised that you should be aiming for the real Womanworld that exists right outside your own door, in streets, shops, restaurants, theatres and public places not far away from where you live a degraded life stuck in 'Manworld' dreaming of that other place which, believe me, is worth experiencing as often as your needs require. Organised events like Fantasia should not be regarded as your final destination but a stopover along the way. Not everyone has the ability to visit Womanworld, so Fantasia Fair provides an outlet for their pent-upped femininity.